4 more almost incomprehensible Malifaux battle reports, with a big pink flying baby with a bad case of piles, hot chicks in leather with big swords, re-animating snipers in a childs playroom and a cast of thousands of mechanical spiders all creating confusion in deepest Essex. I've recently listed 4 Saga Warbands on eBay - they are figures I was selling for a friend, so you probably won't recognise the figures from previous disastrous match reports! 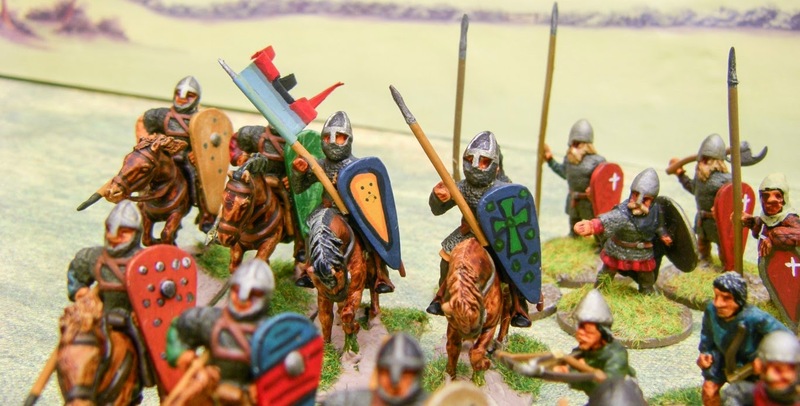 The eBay listing included 2 Norman/Christian armies, one Viking-type Warband and an Arab Warband that can be most any of the Arab factions. As they have now departed my possession I thought it worth sharing the photos here. All I have done is re-base them, and also photographed them with my new model-railway-inspired backdrop - which I think adds a surprising amount to the pictures.